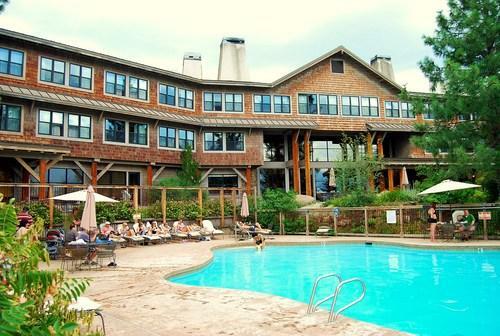 Rent Sun Mountain Lodge | Corporate Events | Wedding Locations, Event Spaces and Party Venues. Sun Mountain Lodge offers magnificent wedding sites that surpass extraordinary. From transcendent outdoor settings overlooking snow-capped peaks and charming valley views, to indoor spaces accommodating everything from intimate gatherings to larger events. Picturesque views, a private patio, and river-rock fireplace make this room a favorite for rehearsal dinners and receptions. Banquet seating accommodates up to 65 people, providing a private, intimate setting for small to medium-sized weddings. This beautifully detailed 1000 square-foot party tent is perfect for outdoor wedding celebrations of up to 100 people. The tent includes windows to take in the views and a covered vestibule area.